Spoiler Warning: This article contains spoilers for the first episode of Sword Art Online: Alicization. Proceed at your own risk. Often hailed as Sword Art Online's best arc, Alicization spans volumes 9 to 18 of the light novel series. The anime adapts the entire arc across 4 cours. The story follows the development of an experimental technology called the Soul Translator, the latest in full-dive technology. The company behind it, Rath, seeks to create the world's first bottom-up Artificial Intelligence. By creating digital copies of newborns' "souls" and placing them into the "Underworld," a virtual medieval realm, they have nearly achieved this goal. However, they need additional help to raise the AI, and they enlist the help of Kirito. In order to make the process as organic as possible, they also erase Kirito's memories of the experiment as he enters the Underworld. His first venture into this strange new world marks the beginning of SAO: Alicization. On September 15th, the hour-long first episode was premiered in 7 countries – Japan, the United States, South Korea, France, Germany, Russia, and Australia. MyAnimeList attended the Australian premiere at Madman Anime Festival in Melbourne. The First Episode — "Underworld"
The first light novel volume of Sword Art Online's Alicization arc (subtitled Alicization Beginning) consists of two prologues and an interlude that cover Kirito's first venture into the Underworld, his discussion with Asuna and Sinon about the Alicization project, and the lead-up into the main story. These two prologues and the interlude are adapted in the first episode. 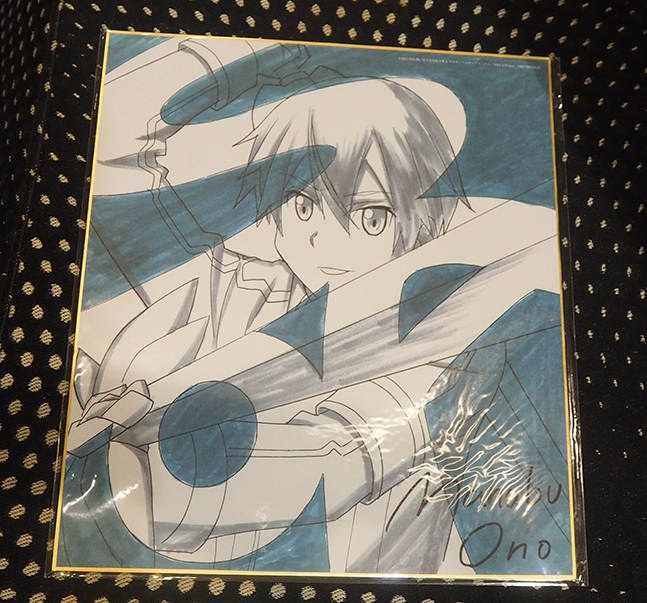 The opening scene depicts a visibly younger Kirito accompanied by his friend Eugeo as they painfully chip away at the massive tree seen in the picture above. This was their Calling: the monumental task they are required to carry out until they die. Alice soon joins the exhausted boys and presents them with a delicious homemade lunch. It is quickly made clear the unbreakable friendship between Kirito, Eugeo, and Alice as they eat and laugh together. As they talk, they form a plan to venture into the mountains to bring back ice in order to keep their lunches fresh. However, upon this expedition, tragedy strikes when they take a wrong turn and end up on the other side of the mountains; the Dark Territory, a place where they are strictly forbidden to go by the laws of the world that are regarded as unbreakable. When Alice trips and accidentally lays her hand across the ground of the Dark Territory, a haunting figure appears and takes note of her infraction in a technical tone before vanishing. Upon returning to the village, all seemed to be well... until the next day when an Integrity Knight arrives to take Alice away to be punished for her crime. Kirito screams and Eugeo freezes in despair as they watch their friend be hauled away in chains. The adaptation of the first prologue is close in its events and themes to the opening scene of Shingeki no Kyojin. Both episodes portray childish innocence shattered by disaster. In the case of Shingeki no Kyojin, the invasion of the titans break the walls that protected not only the characters' physical safety, but their understanding of the world around them. Meanwhile, in Alicization, Eugeo's attitude toward the virtual walls restricting him begin to crack after Alice accidentally breaks the Taboo Index (the unyielding rule of law in the Underworld) and is taken away. 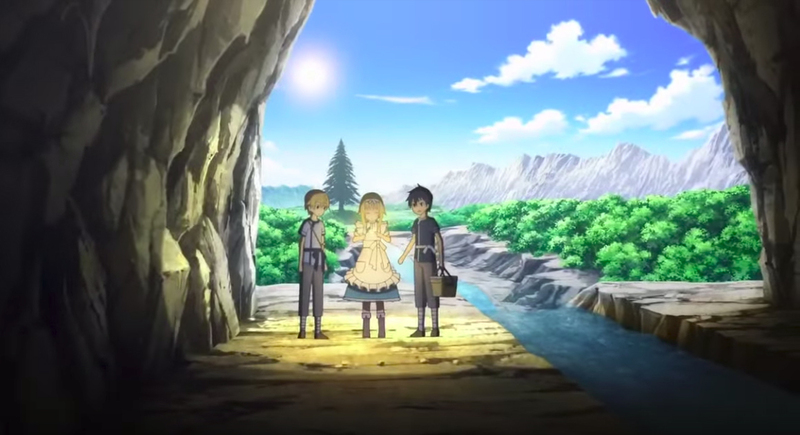 By using this scene to open the first episode, the show begins the slow process of worldbuilding for an all-new realm and raises questions among the audience, questions like "why are all of these strict rules in place," "where in the world is Kirito right now," and "what happened to Alice?" Directly following the incident, Kirito suddenly awakens in a monitored laboratory with tears in his eyes. However, his memories of his short life in the Underworld have been wiped. This moment was not in the original light novel, but I found it to be an emotionally effective addition because it further increases the curiosity and confusion of the audience. This concludes the adaptation of Alicization Beginning's first prologue. Speaking of additions to the original material, the anime adaptation cleverly adds a fun and significant extra scene in-between the light novel's prologues. Kirito, Asuna, Sinon, and the rest of the gang battle against a skilled squad in Gun Gale Online that eventually makes a strategic retreat. However, this is no ordinary squad – one of its members is Subtilizer. As Sinon mentions in the next prologue, Subtilizer was the winner of a recent Bullet of Bullets tournament, and he goes on to become a significant character later on in the Alicization arc. Once again, we see the first episode laying the foundations for the rest of the show. The first volume of the light novel contains a lot of exposition, exposition explaining the technology behind the Alicization project and the nature of the Underworld that Kirito finds himself in. Taking these blocks of exposition and turning them into animation that manages to not drag on is a near-impossible feat. And unfortunately, the first episode fails to effectively control the exposition. The exposition surrounding the Underworld in the first prologue is rushed through, while the pacing of the exposition in the second prologue's adaptation (where the underlying technology is explained) is lethargic, to say the least. In the second prologue, Sinon invites Asuna and Kirito to Agil's Dicey Cafe to ask for their help in the upcoming Bullet of Bullets tournament. After some talk, the discussion shifts to Kirito's "part-time job" as a test subject at Rath's laboratory, and he explains what he knows of the Soul Translation technology and how it works. This block of exposition is incredibly wordy and technical, and it becomes rather dull to listen to as it drags on and on. The adaptation of this scene into anime gave the opportunity of using visual elements to make this exposition more engaging. Instead, we were given plain shots of conversation that slowly cut and panned around the three of them at a table. Nevertheless, the concepts explained are creative and fascinating, and this scene does contain a couple of the clever visual cues that are featured throughout the episode. For example, Kirito states that while he was testing the Soul Translator, he "couldn't tell if the world was real or virtual." As he says this line, we get a side view of Kirito next to his reflection in the window and a chilling low tone from the music, which alludes to the split between the virtual world and the real one, and how the two worlds can be nearly identical. Warning: The next two paragraphs contains heavy spoiler material; if you do not wish to be spoiled, please skip to the next subheading. 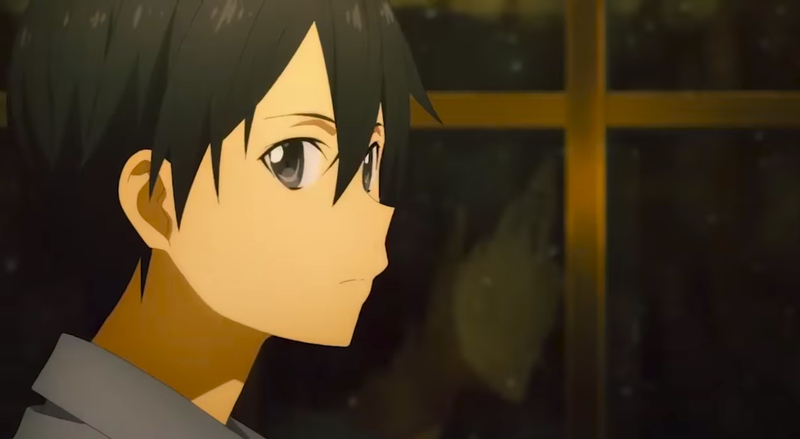 As the three characters leave the bar (cutting into the light novel's interlude) and go their separate ways, we see Kirito momentarily distracted by something unknown before being led away by Asuna. Although I knew what was about to happen since I had already read the light novel, the subtle foreshadowing still gripped me. This was heightened even further by the contrasting colour tones between the interior of the bar (a glowing orangey-brown) and the exterior alley (a shadowy grey). As I watched and listened intently, I found that I could feel my heart pounding in my chest and that it was beating in time with the heavy thumps of the foreboding background music. As Kirito and Asuna walk, Kirito suddenly stops and confesses that he wants to go to America to study full-dive technology and that he wants Asuna to come with him. Asuna says yes, which results in a touching moment that soothes the foreboding tension. However, that was all set aside by another subtle visual cue – as the pair walk away, the headlights of a car flash by at the bottom of the screen, revealing, for just a split-second, the shadow of a person. As it turns out, they were being stalked by the third member of the group behind Death Gun and the last surviving member of the Laughing Coffin guild, Johnny Black. Kirito attempts to grab his sword, only to grasp air. At this point, the cinema burst out into laughter, but I sat there too tense to even let out a chuckle. Johnny Black brandishes a familiar syringe (like the kind used by Kyouji in Sword Art Online II) and rushes Kirito. Instinctively, Kirito pushes Asuna out of the way and manages to stick the point of his umbrella into his adversary's leg, but was unable to avoid the attack. As Kirito is injected with the poison and falls to ground unconscious, everything goes quiet; Asuna cries out, and the credits roll. While the execution of the first episode may have lacked in some areas, the first episode of the much-anticipated Sword Art Online: Alicization leaves the viewer ready for more, desperate for answers to a slew of dangling questions. First, a short pre-recorded video from the Japanese voice actors for Kirito and Eugeo, Yoshitsugu Matsuoka and Nobunaga Shimazaki, in which they gave a special message to fans at MadFest. When asked on-video what they wanted the audience to get from the series, they replied that they hoped the fans would notice how hard they've worked to bring the series to life and fill it with emotion. Another pre-recorded video was shown afterwards, this time presenting the English voice actors for Asuna and Kirito, Cherami Leigh and Bryce Papenbrook. In this instance, the two were asked a series of questions relating to Sword Art Online and their thoughts about Australia. When asked what each of their favourite Australian snacks were, Cherami answered Tim Tams (a girl of culture indeed), specifically the Double Chocolate or Dark Chocolate variety. Bryce proclaimed his adoration of Melbourne coffee and the classic Australian Tim Tam Slam. Of course, there were some serious questions as well: Will Kirito's cooking ever get better? Will there be any more harrowing moments like the death of Sandwich-kun? Next, Japanese idol and singer of multiple SAO songs, Luna Haruna, was brought on stage. Luna was asked where she had been so far in Australia, to which she answered the Queen Victoria Market and "Luna Park because it's just like me, Luna." When asked who her favourite SAO character was, she answered Klein because "he fools around all the time but he cares for his friends." Luna then gave us a live performance of the first season's second ending theme, Overfly, much to the enthusiasm of the glowstick-wielding front row. 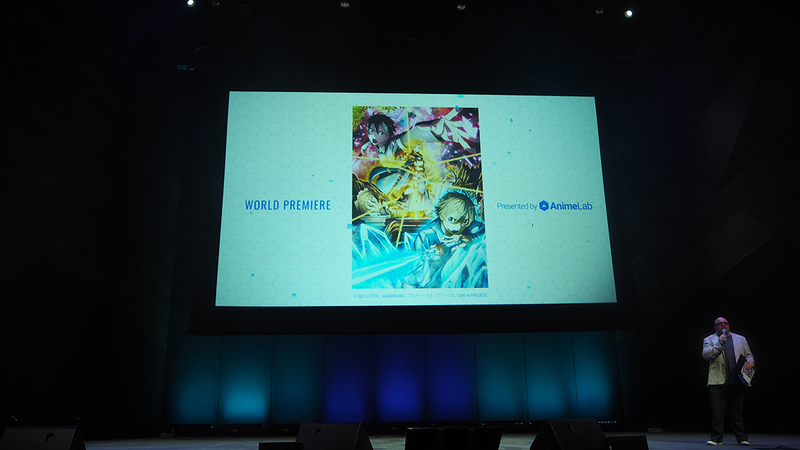 Following the actual premiere, a blooper reel of screw-ups, improv, and more by the English voice actors from across both previous seasons and the movie were shown, which gave a unique insight into what an R-rated Sword Art Online might possibly be like. The audience (including myself) laughed at familiar moments that had suddenly been filled with swear words, flubbing, odd sounds, meta jokes, and dirty lines. It was certainly something to behold. Romcoms are a genre of anime that has seen its fair share of cliches. Sakurasou, however, is unique.